Free the pain from Morton’s Neuroma! Many patients presents to our specialist podiatry practice in Perth with problems related to Morton’s neuroma. It is a common condition affecting the ball of the foot which causes pain, numbness and an interruption to daily activities. 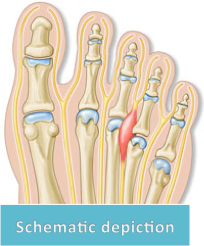 Surgery for Morton’s neuroma is the most definitive treatment option for the condition, and involves excising the damaged nerve from the top of the foot. This procedure is performed within hospital on a day surgery basis and takes around 20 minutes. After morton’s neuroma surgery, patients are permitted to weightbear straight away and wear a splinted sandal for up to 2 weeks. Generally patients return to normal shoes and activities after this time and rarely have ongoing problems related to the neuroma. This website is intended for general information purposes only. Any surgical or invasive procedure carries risks. Before proceeding, you should seek a second opinion from an appropriately qualified health practitioner. For more information on Morton’s neuroma surgery in Perth, we recommend making an appointment to see our specialist podiatric surgeon Dr. Andrew Knox.